This week has been featured some unseasonably mild weather in the Mid-Atlantic region, but a strong cold frontal passage on Friday will usher in a much colder air mass for the weekend and there are reasons to believe that we may be entering an extended cold and stormy stretch of weather. A tropical disturbance known as the Madden-Julian Oscillation (MJO) is forecasted to enter into “phases” that argue for colder-than-normal conditions in much the eastern US for an extended period of time. In addition, the overall pattern is shaping up to be quite active with numerous systems likely to cross the country in coming days and threaten this region with lots of wintry precipitation. The Madden-Julian Oscillation (MJO) is a tropical disturbance that propagates eastward around the global tropics with a cycle on the order of 30-60 days; hence, it is commonly referred to as the 30-60 day oscillation. It is a large-scale coupling between atmospheric circulation and tropical deep convection. Rather than being a standing pattern (like “El Niño/Southern Oscillation”) it is a traveling pattern propagating eastwards at approximately 4 to 8 meters/second, through the atmosphere above the warm parts of the Indian and Pacific oceans. The MJO is characterized by an eastward progression of large regions of both enhanced and suppressed tropical rainfall, observed mainly over the Indian Ocean and the Pacific Ocean. Research has found that the location of the MJO or its “phase” is linked with certain temperature and precipitation patterns around the world. 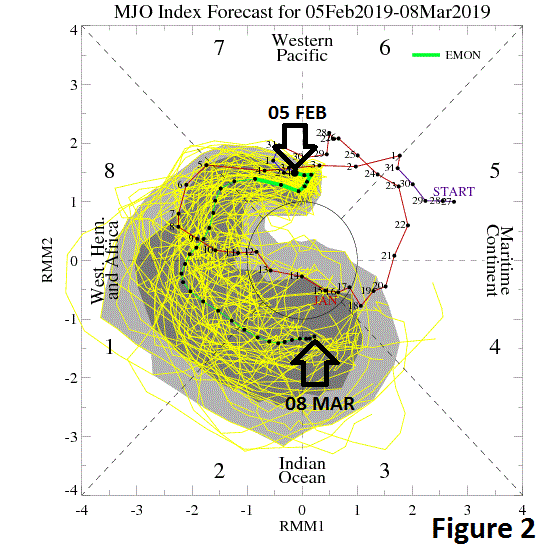 Figure 2 illustrates the forecasted progression of the MJO (in a counter-clockwise fashion) from this week until the early part of March. When the index is within the center circle, the MJO is considered weak, meaning it is difficult to discern. Outside of this circle, the index is stronger and will usually move in a counter-clockwise direction as the MJO moves from west-to-east. The forecast displayed for the MJO by the ensemble version of the Euro is for it to propagate slowly through phases 8, 1 and 2 and then into phase 3 with a relatively strong magnitude. Figure 3 illustrates the composite temperature pattern expected across the US this time of year for each of the MJO phases and these phases (8, 1, 2 and 3) typically result in colder-than-normal conditions for much of the eastern US – and this is right where we appear to be headed. Figure 4 displays the typical 500 millibar height pattern in February when the MJO is in phase 8 during an El Nino winter season such as this and there is a trough in the eastern US and high-latitude blocking over Greenland which favors cold and stormy weather around here. The overall weather pattern looks quite active in coming days with multiple waves likely to first slam into the west coast and then traverse across the country. One wave will arrive in California by the early part of the weekend and then reach the Great Lakes region by Sunday evening (Figure 1). This wave could produce rain in coastal sections of California early this weekend and heavy snow in the Sierra Mountains where incredible amounts have piled up in recent days. This system may then move rather quickly and spread some snow into the Ohio Valley by later Sunday and some snow could break out in the Mid-Atlantic region on Sunday night into early Monday. A second and stronger wave will follow quickly and it’ll first slam into the Pacific Northwest by the middle of the weekend bringing more heavy rain and snow to that area and then it’ll head towards the Great Lakes. At the same time, strong high pressure will build into southeastern Canada supplying the Northeast US/Mid-Atlantic with plenty of low-level cold air for the early and middle parts of next week – a very important player in this unfolding pattern (Figure 5) and always a red flag for frozen precipitation. An initial wave of low pressure may cut up to the eastern Great Lakes early next week while a secondary system forms off the Mid-Atlantic coastline. Copious amounts of moisture will likely push north into the Mid-Atlantic region by late Monday night or early Tuesday morning and this could result in some serious snow, ice and/or rain - and perhaps all three. The potential is certainly there for a big wintry event in the Mid-Atlantic region. One of the questions to try to answer over the next few days will be whether the initial low pressure system that cuts up to the eastern Great Lakes will be the dominant player or if the secondary low pressure system takes over quickly which would lead to more snow and an overall colder solution for the Mid-Atlantic region. Yet another Pacific storm may slam into the western US late next week and it too could ultimately have a big impact around here. Stay tuned…an active pattern is unfolding and the MJO index suggests there will be plenty of cold air around.